Imagine that you are shopping – it doesn’t matter whether your grocery shopping or preparing to buy large, high-tech office equipment – and you have the choice of buying from a well-known company with a good reputation, or one you’ve neither seen nor heard of before. Which one would you choose? Whether you’re deciding on a box of cereal or a high-end car, your choice is clear. People want to do business with someone they trust. And you can’t trust someone you’ve never heard of, can you? Or, simply put, consistency over time builds trust. Determine your most compelling message for your target audience. Then, regardless of the media you decide to use, get that message in front of your audience on a regular basis over a period of time. This becomes the “Magic Multiplier”. Top-of-Mind Awareness is the key. This formula has been tested and proven, over and over again. And it’s accurate for the new, little guys as it is for the Bigwigs. After all, why do the Biggies keep promoting themselves long after they’ve become “household names”? It’s simple. They understand the importance of Top-of-Mind Awareness. Any advertising or publicity you did last year is last year’s news, long forgotten. So when you’re planning where and how to use your precious marketing dollars, be sure your marketing plan makes the most of your money by using a combination of marketing vehicles: from the more expensive advertising methods, to less expensive public relations methods, to virtually free social media. Any integrated plan that combines marketing vehicles stretches your dollar so you can have consistency over a longer period of time. Rule of Seven: People need to see/hear your message 7 times before they will begin to remember it. That’s seven messages over time. So, sending out a press release every other month will get your message in front of editors who, over time, will recognize and remember your message, and begin to write about your company. Meanwhile, you can be sending informative e-mails to your audience on a regular basis, too, and they’ll begin to remember you. If they also see your consistent advertising over time, they will recognize you more quickly. We tell our clients that it will take 12-18 months to see the results of their integrated marketing methods. It simply takes that long for enough people to see and hear your message at least 7 times through multiple media so they begin to recognize and remember it. 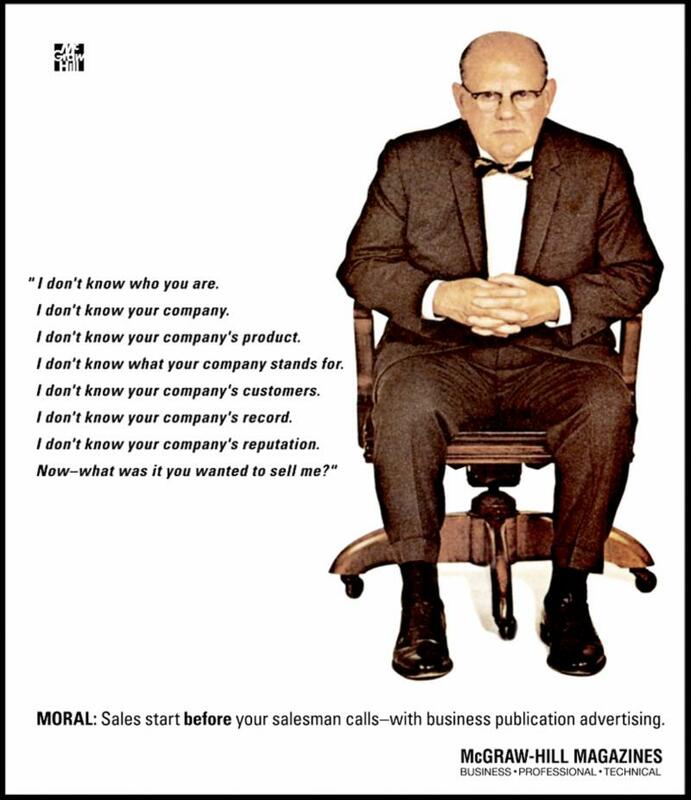 In my company we have a large blowup of an old McGraw-Hill Magazine ad that we fondly call “The Angry Man.” Stodgy, imposing and unyielding, he sits alone on an office chair, glaring nastily at you, the reader, so that you can’t help but stop and listen to his message. “I don’t know who you are. I don’t know your company. I don’t know your company’s product. I don’t know what your company stands for. I don’t know your company’s customers. I don’t know your company’s record. I don’t know your company’s reputation. Now, what was it you wanted to sell me? You could call him your typical potential customer. Not necessarily angry, we hope, but certainly typical of the attitudes your salespeople encounter on a regular basis. If they haven’t even heard your company’s name, or what you do, or what you sell, your salespeople have huge hurdles to overcome before gaining the necessary trust to buy from you. Imagine how much more productive your salespeople could be if your potential customers knew these things about your company ahead of time. Instead of spending their time trying to just gain name recognition, and educating your potential customers about your company, sales calls can instead be used for…sales! People only buy from people they trust. If they’ve never heard from you, or don’t know what you sell, they can’t possibly trust you or buy from you. But if you apply the principles discussed here, and stick with your plan over time, you will become a trusted source in your industry. You’ll generate qualified leads and your sales people will be met with smiles, not glares, as they shake hands and close the deal. Headquartered in Rockville, MD, RMR & Associates, Inc. (RMR), has been addressing the unique needs of clients serving commercial, B2B, government and IT sectors for over 25 years. RMR’s integrated marketing includes public relations, social media, advertising, direct mail, media buying, list rental, website design and interactive marketing. RMR’s unique, national experience and knowledge base has helped to build an extensive network of key contacts among venture capitalists, key organizations and key business leaders. With more than 500 product and company rollouts and repositionings, RMR has garnered results for local, national and international clients. 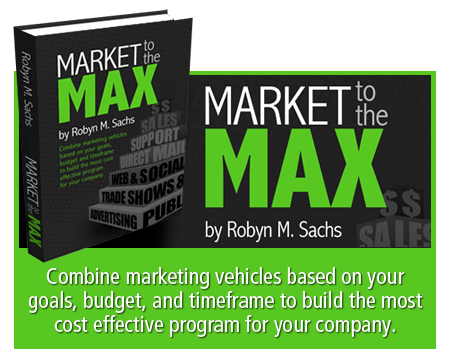 Robyn Sachs, President, can be reached at rsachs@rmr.com.